The Plaster Fun House has two main conceptual inspirations. Firstly, the clients' love of Art Deco and P & O style Architecture. Secondly, their style and taste; often dressed in bold and bright colours they have an extensive collection of unique Italian and Czech glassware and German Pottery. From the architect: As a young couple, the clients wanted to replace the small lean-to on their 2-bedroom cottage with a functional kitchen that provided them with a space to entertain and open up to the backyard. 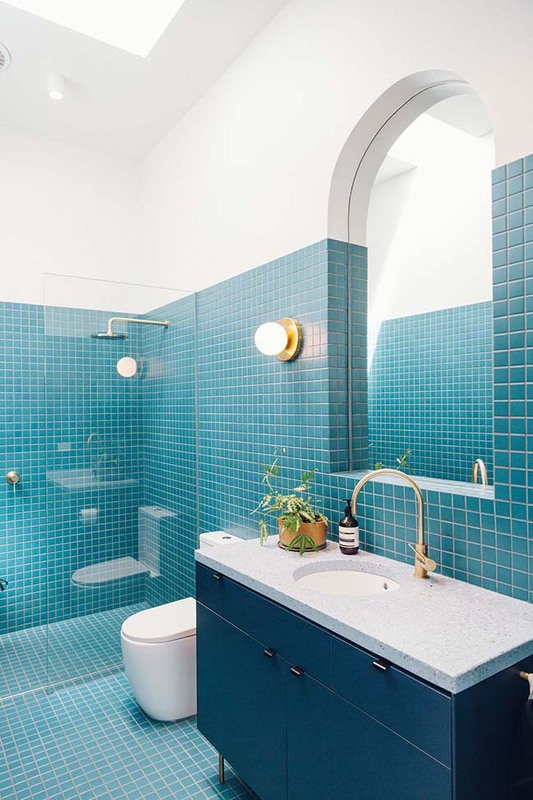 They wanted a space that was fun, full of light and compact. Spatially we decided to splice the existing residence. 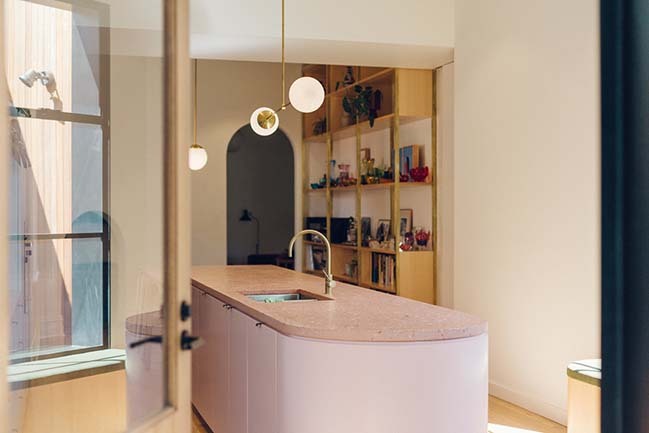 The cottage already housed a good sized dining room, which was integrated into the extension by running a singular kitchen island/dining table through the two spaces. 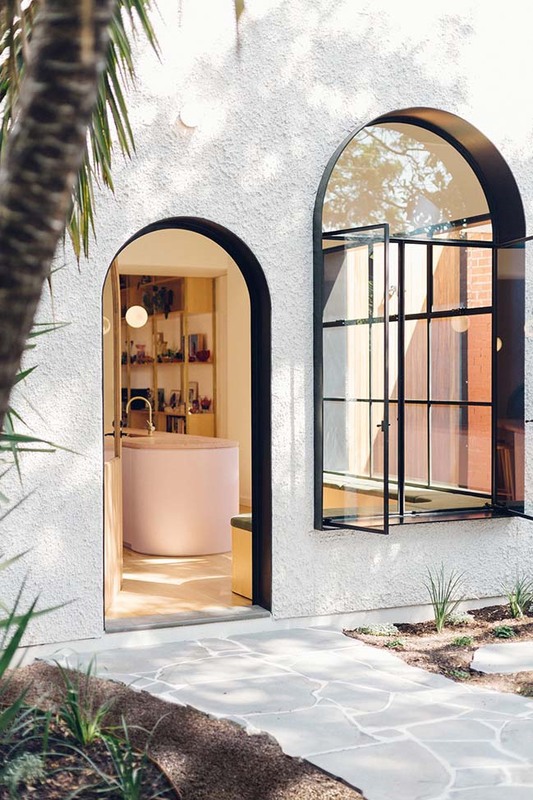 The existing bathroom was expanded and a laundry added adjacent. Working to a tight budget, the space needed to pack in a lot whilst also performing environmentally. The building is clad in highly insulated EPS panel with deep reveals to the windows - adding some degree of sun shading. 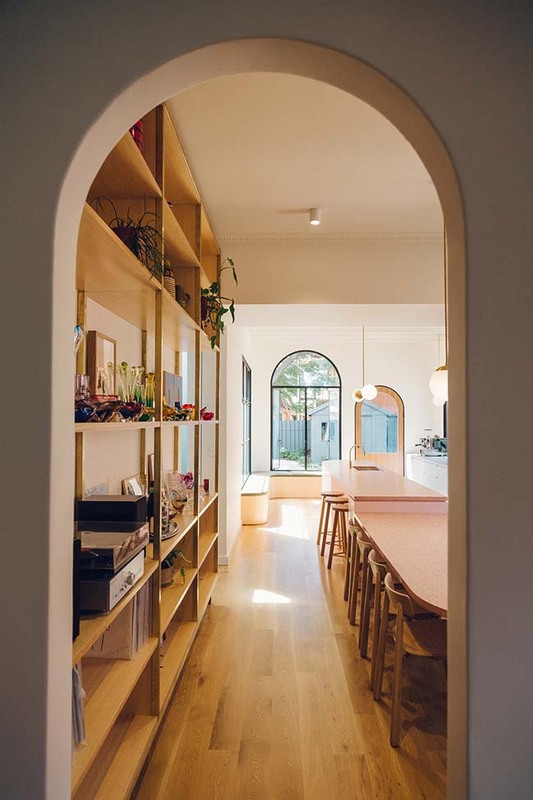 The alteration has upgraded the cottage into an expansive and functional home. 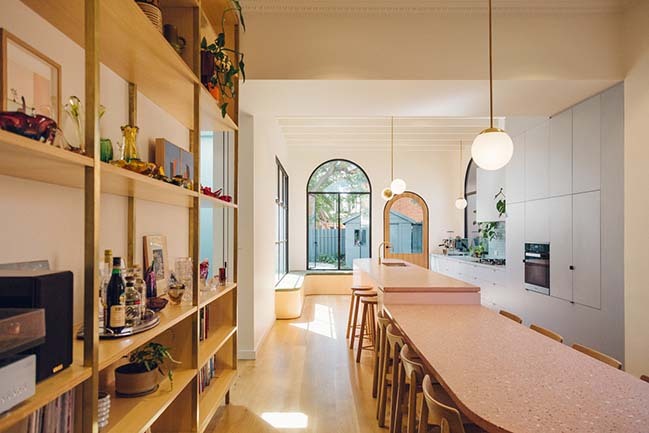 It is a playful and light-filled space for the clients to cook, entertain and relax in. 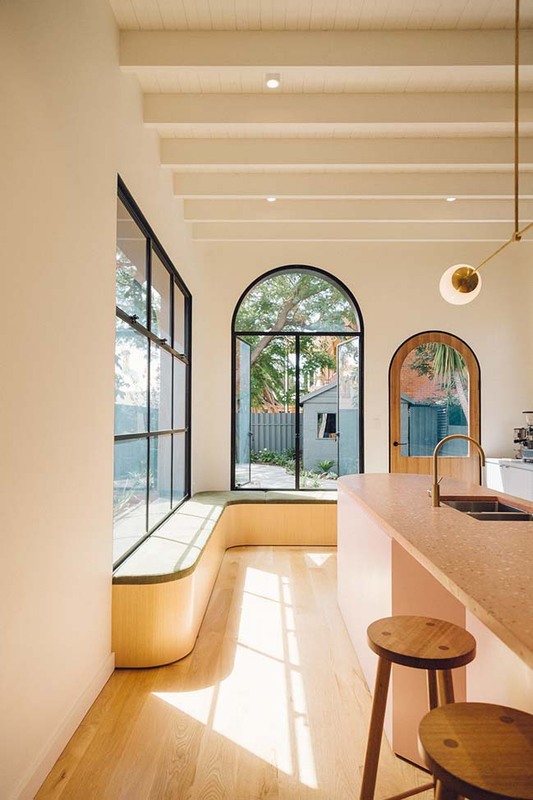 They wanted a kitchen where they could keep each other company whilst cooking, the corner bench creates this nook to relax or read in the sun. The opportunity to bring sun into the space has been embraced. The addition softens into the backyard, letting more greenery and light in than any other part of the house. 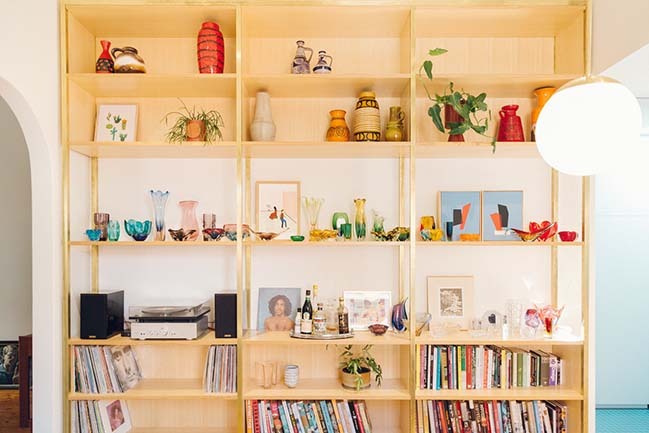 The space feels like an oasis - a bright, art-deco moment within a largely austere suburb. 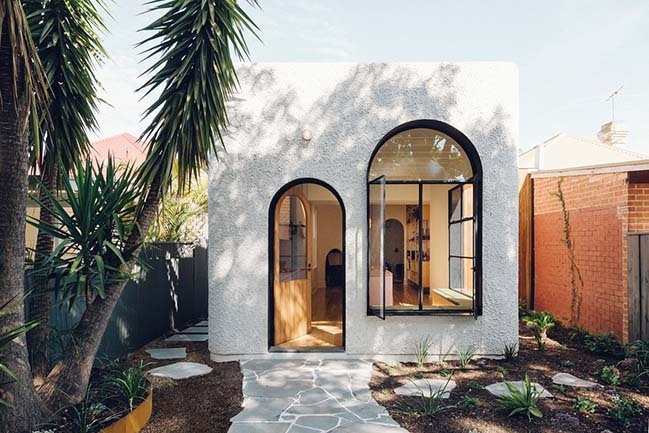 The project intentionally resists the surrounding building styles (1900s workers cottages and 60s cream and brown brick), forming its own identity through the use of plaster and arches; playing off the large trees and greenery of the backyard. 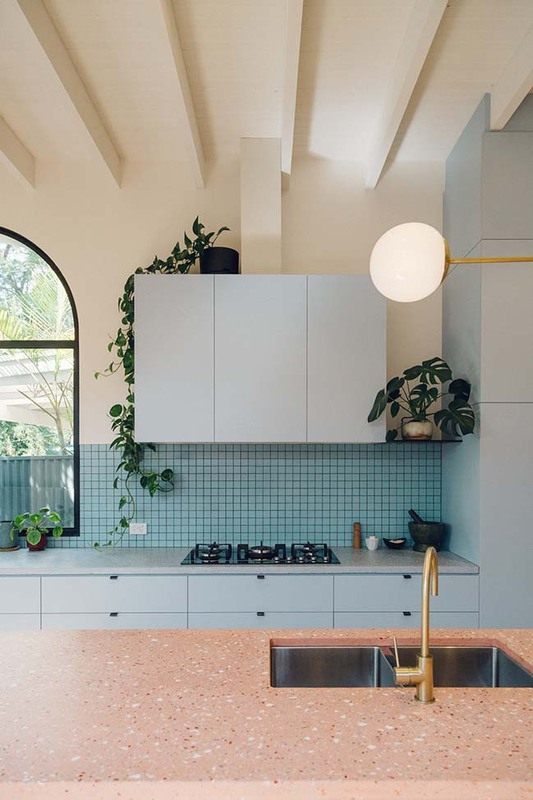 The use of terrazzo, though very much requested by the clients, is a subtle nod to the 50s and 60s Italian-owned porches of the area. 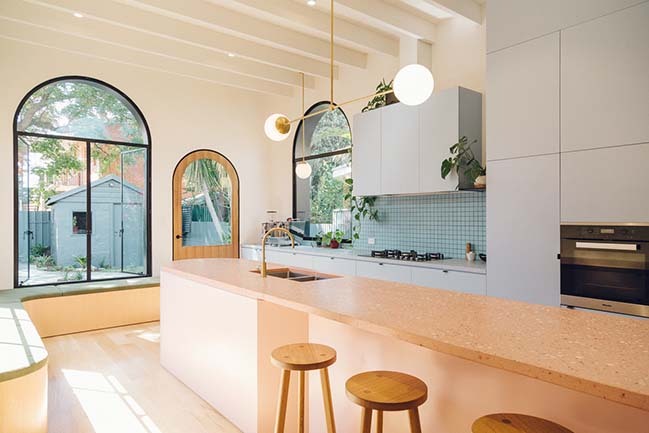 The extension is set back from the Northern boundary, allowing light to flood into the kitchen, with the laundry and bathroom using skylights to provide natural light to those spaces.